Saturday, 12 January, dawned partly cloudy and windy, and became mostly overcast mid-day. There was light rain late Saturday night into Sunday morning, 13 January, totaling 0.17". Cloudy nights continued until Friday, 18 January. That night I went out to the observatory to do a Dry Run with my planned Total Lunar Eclipse astrophotography setups. 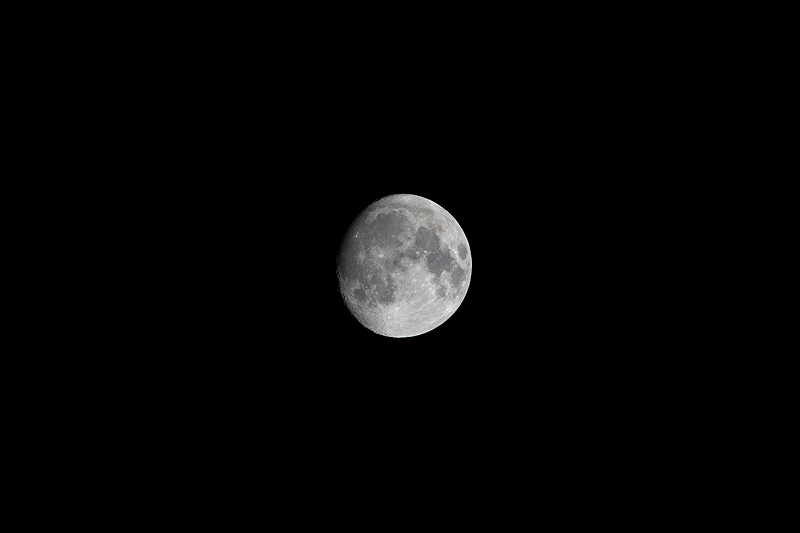 The Moon was a waxing gibbous phase. Unfortunately, the current weather forecast for eclipse night, Sunday, 20 January, has cloudy skies. SYNCed observatory clock to WWV. 1821 MST: LX600 ON, StarLock OFF, High Precision OFF. Viewed the Moon, 102X and 81X. 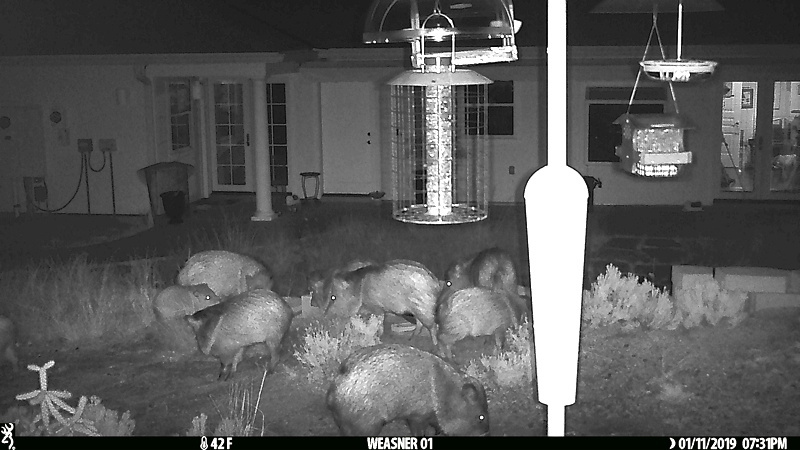 I then began setting up the DSLRs on the observatory patio. The D850 with a 150-600mm lens was mounted on a SkyTracker Pro and the D7200 with an 8mm fisheye lens was mounted on a camera tripod (non-tracking). I set the SkyTracker Pro to lunar tracking rate. I returned to the 12" LX600 telescope and set its tracking rate to lunar. I mounted the iPhone 8 Plus on the 2" 30mm eyepiece (81X) using the Levenhuk Smartphone Adapter. The Moon (which was near Perigee) nicely filled the eyepiece field-of-view. Took this iPhone afocal 81X photo of the Moon using the iOS app NightCap Camera (ISO 22, 1/5300sec). 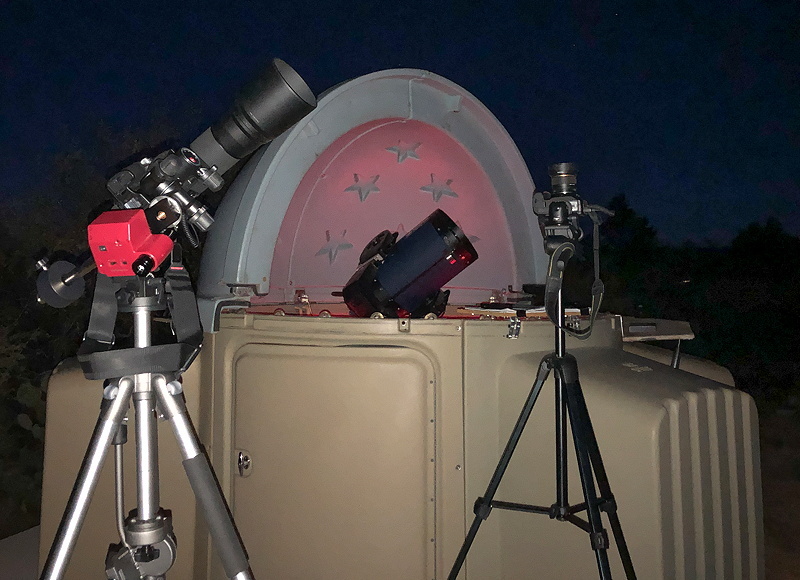 1851 MST: polar aligned the SkyTracker Pro. I used it as a guide for this night's dry run. For the Eclipse, the D850 FL600mm photos will be used to create a montage of eclipse photos. A D850 FL150mm photo will be used to show the totally eclipsed Moon and the Beehive Cluster (M44) 6.5° to the east of the Moon. 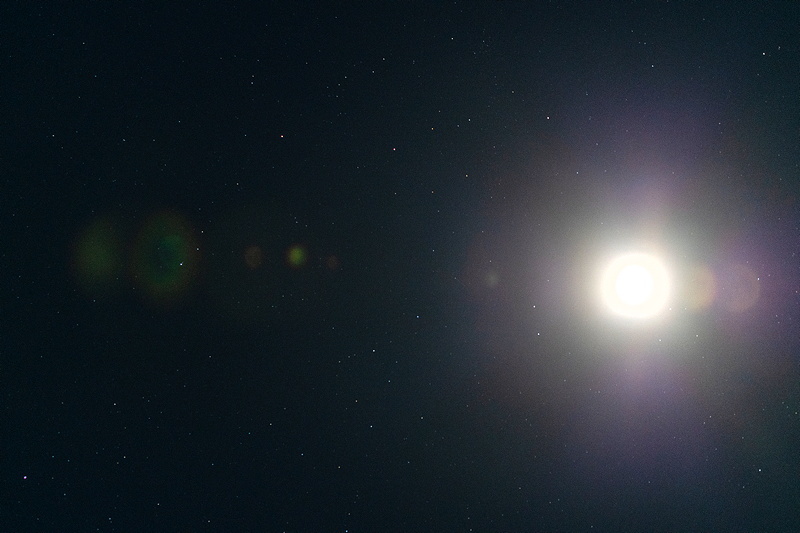 The test photo above at FL 150mm shows the overexposed Moon but also shows some stars. The D7200 FL 8mm fisheye photos will be used to create a montage of photos showing the Moon's motion across the sky and the eclipse phases as the Eclipse proceeds. 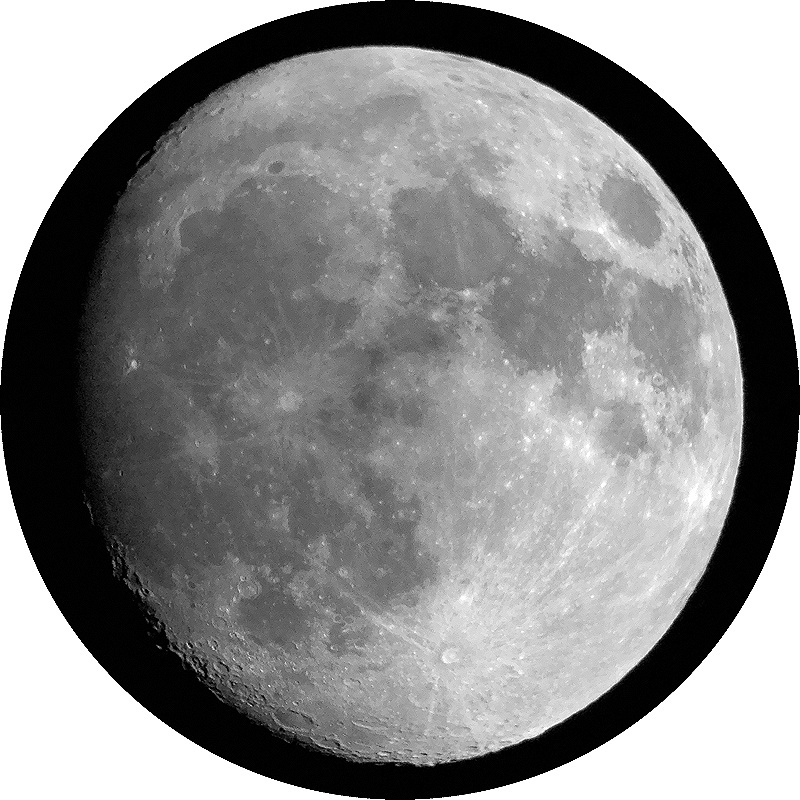 The partial phases photos will be merged with a long duration photo taken at mid-eclipse that shows the stars. 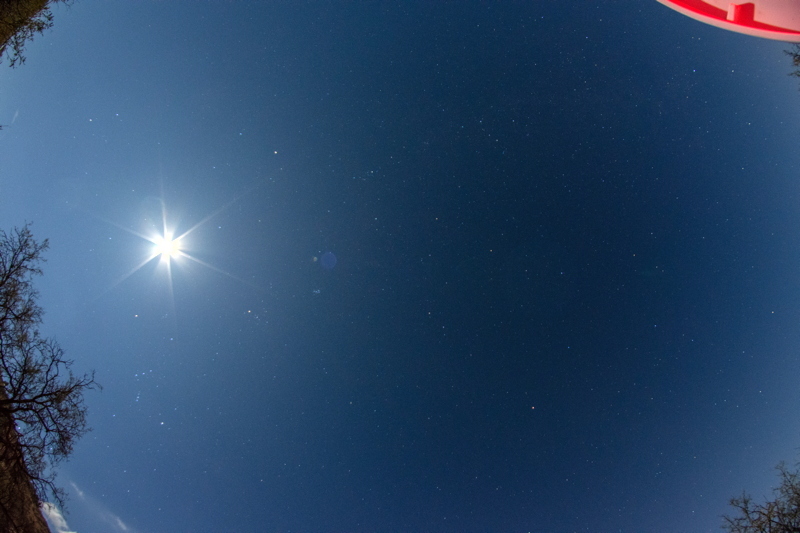 The 10 second FL 8mm fisheye photo above shows the Moon (overexposed) above the constellation of Orion. The humidity was high enough this night that papers, equipment, and even the observatory dome, were damp. Since I had accomplished what I wanted for this night's dry run I ended the session.